You will be able to stop your bus at any location of your choice and enjoy the sights offered by the city. You can visit the amazing bars located in the Gulf Coast with all your friends and family or you can attend a concert or sporting event as a group using the bus charter service offered by our company. You can have all the fun when you opt to use 50 passenger charter buses for your group traveling needs, while you are here. Whether you are looking for 20 passenger mini buses or 30 passenger shuttle buses service to any particular area in the city, you can make the reservation easily through our website. You can also request for the quotes online if you want to know the rates for particular trips made by our charter bus service. 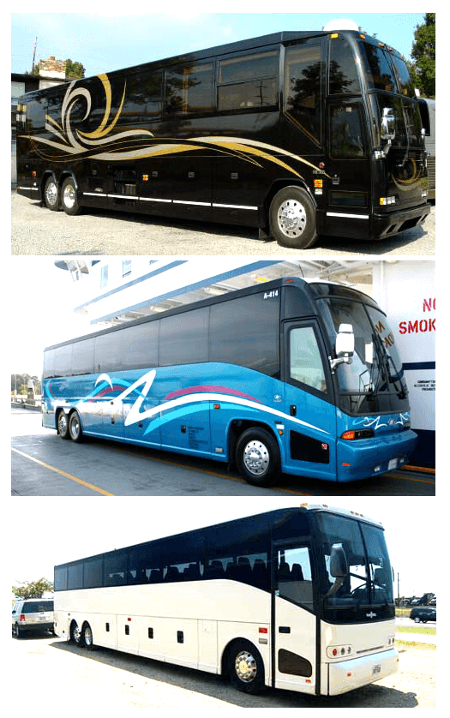 You can find charter bus rental with most extensively decorated interiors and with uniformed and professional drivers. The buses come with different passenger amenities like Wi-Fi, TV, docking station, media player, etc. You will enjoy the customer service provided by the chauffeurs and reservation staff of our charter buses. You can also call to reserve our party bus rental in Sarasota. We can cater to any special occasion. Do you have questions? Call us 813-514-6980. There are many places in town which will entertain the kids as well as adults in your group. Jungle Gardens; if your group includes kids this tropical garden is worth visiting with lots of animal shows and adventures for kids. Siesta Key Beach; located a few miles south of Sarasota city, this beach offers the whitest and finest sand and amenities like beach volley courts, soccer field, picnic tables etc. to enjoy your day. Le Barge Tropical Cruise; you will be able to enjoy the scenic beauty of Sarasota bay. You can get a panoramic view of the city from the bay. Chill Lounge Events; the events are held regularly to entertain adults of 21 and above. You can expect music, food, liquor and a completely relaxing atmosphere. Get our 40 passenger charter buses to reach the event location. St. Armand’s Circle; you can find wonderful restaurants and high end-shops with antiques, fashion dresses, precious gems, etc. here. Our bus charter is the best way to reach the city from the nearest Sarasota Bradenton International Airport. We find pleasure in serving our customers and your preferred charter bus with well mannered chauffeur will be waiting to receive you at the airport to take you to your destination. Another option for airport transportation includes Sarasota limo rentals. Hire charter bus to visit any of the following neighborhood cities and towns: Saint Petersburg, Tampa, South Venice, Gulf Gate Estates, Fruitville, North Port, Englewod, Bayshore Gardens, Palmetto and Bradenton. You will enjoy any of the city sightseeing tours that are offered when you opt for charter bus rental.